With its spicy Mediterranean flavor, the natural essential rosemary oil in Klar's rosemary soap awakens and enlivens weary minds when washing. Manufactured on a pure vegetable oil base from organic farming. Free of artificial fragrances. For 170 years, now in the now fifth generation, we have been producing high-quality soap products according to old and new recipes and methods. In our factory in Heidelberg, in the context of a careful production process with a fivefold rolling, particularly compacted and high yield soaps arise. Quality and tradition are particularly important to us. We use only the finest ingredients for our products that - in addition to modern production techniques - we partly produce by hand with the help of up to 100 years old molds. Just as great an importance as to the preservation of traditional recipes, we put on constant innovation in terms of highly functional and above all sustainable herbal ingredients. Each of our products tells its own unique story. 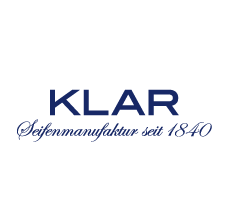 But one thing unites all Klar Soaps: to create memorable cleansing experiences for all senses.